To ensure an innovative and focused approach to advance the CTBT’s ratification by the remaining Annex 2 States, a group comprising eminent personalities and internationally recognized experts was launched on September 26, 2013 at the United Nations Headquarters in New York. 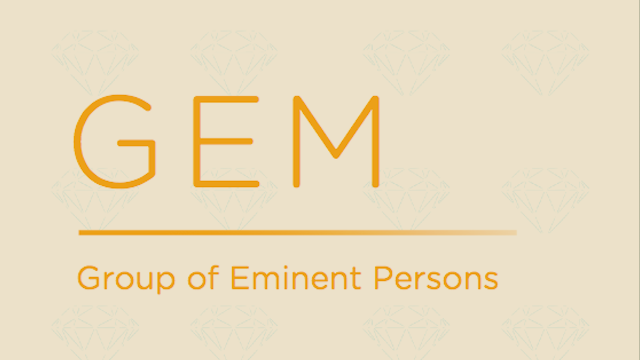 Through their expertise, experience and political standing, this Group of Eminent Persons (GEM) will support and complement efforts to promote the Treaty’s entry into force as well as reinvigorating international endeavours to achieve this goal. The Presidents of the Article XIV Conference, the Foreign Minister of Hungary, János Martonyi, and the Foreign Minister of Indonesia, Marty Natalegawa, will also be members of the GEM. Nobuyasu Abe served as the United Nations Under-Secretary-General for Disarmament Affairs from 2003 to 2006. He was the Ambassador of Japan to the International Atomic Energy Agency and other international organizations in Vienna from 1999 to 2001, and Director-General for Arms Control and Science at the Japanese Ministry of Foreign Affairs from 1997 to 1999. He currently holds the position of Director of the Center for the Promotion of Disarmament and Non-Proliferation at the Japan Institute of International Affairs. Hans Blix is a diplomat and politician who was the Swedish Minister for Foreign Affairs from 1978 to 1979. He subsequently served as the Director General of the International Atomic Energy Agency from 1981 to 1997. From 2000 to 2003, Blix was Executive Chairman of the United Nations Monitoring, Verification and Inspection Commission which investigated Iraq's compliance with its obligation to be rid of its weapons of mass destruction. Des Browne, Lord Browne of Ladyton, is a British Labour Party politician and a former Member of Parliament. He served as the United Kingdom’s Secretary of State for Defence from 2006 to 2008 and as Secretary of State for Scotland from 2007 to 2008. A member of the House of Lords since 2010, he is now the Convenor of the Top Level Group of UK Parliamentarians for Nuclear Disarmament and Non-Proliferation, and the Chair of the Executive Board of the European Leadership Network. Jayantha Dhanapala served as United Nations Under-Secretary-General for Disarmament Affairs from 1998 to 2003. He served as Ambassador of Sri Lanka to the United States of America SA from 1995 to 1997 and to the UN Office in Geneva from 1984 to 1987. He is currently the 11th President of the Nobel Peace Prize-winning Pugwash Conferences on Science and World Affairs, Deputy Chairman of the Governing Board of the Stockholm International Peace Research Institute (SIPRI), and a member of several other advisory boards of international bodies. Cristian Diaconescu is currently the Chief of Staff and Adviser to the President of Romania, Traian Băsescu. He served as Romania’s Minister of Foreign Affairs in 2012 and from 2008 to 2009. Diaconescu sat in the Romanian Senate from 2004 to 2012, serving as Minister of Justice in 2004. Prior to this he was Secretary of State for Bilateral Affairs at the Foreign Affairs Ministry. He represented Romania as deputy Head of Mission to the UN and the Organization for Security and Cooperation in Europe in Vienna. Wolfgang Hoffmann served as the first Executive Secretary of the Preparatory Commission for the Comprehensive Nuclear-Test-Ban Treaty Organization from March 1997 until August 2005. Prior to this he was the German Ambassador to the Conference on Disarmament in Geneva from 1993 to 1997, where negotiations for the Comprehensive Nuclear-Test-Ban Treaty took place between 1994 and 1996. A lawyer by profession, Hoffmann entered the German Foreign Service in 1965 where he held different positions, especially in the multilateral field. John Matthew Patrick Hutton, Lord Hutton of Furness, is a British Labour Party politician and was a Member of Parliament from 1992 to 2010. He served as the United Kingdom’s Defence Secretary of State from 2008 to 2009 and as Secretary of State for Business, Enterprise and Regulatory Reform from 2007 to 2008. He is currently Chairman of the Royal United Services Institute for Defence and Security Studies and a Member of the House of Lords, where he has served since 2010. Igor S. Ivanov is the President of the Russian International Affairs Council (RIAC) and a Professor at the Moscow State Institute of International Relations. Previously, he served as Minister of Foreign Affairs of the Russian Federation from1998 to 2004 and Secretary of the Security Council of the Russian Federation from 2004 to 2007. He holds the rank of Ambassador Extraordinary and Plenipotentiary and is a corresponding member of the Russian Academy of Sciences. Johannes Kyrle has served as Secretary-General of Austria's Ministry of Foreign Affairs since 2002. During this time he has also been a member of the National Security Council, advising the Federal Government on principal matters of foreign, security and defence policy. From 1997 to 2002 he was the Chief of Protocol at the Austrian Foreign Ministry and the Austrian Ambassador to the Principality of Liechtenstein with residence in Vienna from 1991 to 2002. Ho-Jin Lee, formerly a career diplomat of the Republic of Korea (ROK) is currently Principle Vice President of the United Nations Association of the ROK. He has specialized in East Asian security, arms control and non-proliferation, and nuclear energy. He was the ROK’s Ambassador to Finland from 2008 to 2010, to Hungary from 2003 to 2006, and Ambassador and Deputy Permanent Representative to the United Nations from 2001 to 2003). He served as a member of the UN Advisory Board on Disarmament Matters from 2004 to 2008 and as its chairman in 2007. Xolisa Mabhongo has been the Permanent Representative of South Africa to the United Nations and international organizations in Vienna as well as Ambassador to Austria, Slovakia and Slovenia since January 2010. He was the Chairman of the CTBTO Preparatory Commission in 2010 and is a member of the Board of Governors at the International Atomic Energy Agency. He was also the head of the UN Political Affairs desk of the South African Foreign Ministry between 2006 and 2009. Federica Mogherini is President of the Italian delegation to the NATO Parliamentary Assembly and a member of the Committees on Foreign Affairs and Defence in the Italian parliament. She was elected to the parliament’s Chamber of Deputies in 2008, where she has served as Secretary of the Defence Committee and as a member of the Parliamentary Assembly of the Council of Europe. Mogherini specializes in foreign policy and international security issues. Marc Perrin de Brichambaut has been a State Councillor in the Litigation Section of the State Council (Conseil d'Etat) in Paris since 2012. He served as Secretary General as the Organization for Security and Co-operation in Europe (OSCE) from 2005 to 2011. Since entering public service in 1974, he has held a variety of senior positions in the French civil service, including Ambassador and Head of the French Delegation to the OSCE from 1991 to 1994. Kevin Rudd is a member of the Australian Parliament. He was Prime Minister of Australia and Leader of the Australian Labor Party (ALP) from June to September 2013 and from December 2007 to June 2010. He was the Australian Minister for Foreign Affairs from 2010 to 2012. Previously, in Opposition he was the shadow Minister for Foreign Affairs from 2001 until 2006 when he became the leader of the ALP. Prior to joining Parliament, Rudd was a diplomat, a senior adviser and then official in the Queensland State Government and a business consultant on China. Sha Zukang served as the United Nations Under-Secretary General, Department of Economic and Social Affairs, from 2007 to 2012. In 2010, he was nominated as the Secretary General of the 2012 UN Conference on Sustainable Development. From 2001 to 2007 he served as Permanent Representative of China to the UN Office at Geneva. He established the Department of Arms Control in the Chinese Ministry of Foreign Affairs, which he headed from 1997 to 2001. As Ambassador of Disarmament Affairs from 1995 to 1997, Sha was China's chief negotiator of the CTBT. Héctor Timerman has been the Minister of Foreign Affairs of Argentina since 2010. Prior to this, he served as the country’s Ambassador to the United States of America from 2007 to 2010. Timerman is co-founder of Americas Watch, the western hemisphere chapter of Human Rights Watch and directed the Buenos Aires office of the Permanent Assembly for Human Rights from 2002 to 2004. He also worked as a columnist for The New York Times, Los Angeles Times, Newsweek and other international media. János Martonyi was appointed Minister of Foreign Affairs of Hungary in 2010, a position which he also held from 1998 to 2002. Between 1994 to 1998, and 2002 to 2009, he was Managing Partner of Martonyi and Kajtár, Baker & McKenzie Law Firm in Hungary. Previous political posts have included Administrative State Secretary at the Ministry of Foreign Affairs from 1991 to 1994 and at the Ministry for International Economic Relations from 1990 to 1991. He is a professor of International Trade Law at the University of Szeged.